Since 1989, more than 2,000 people have been acknowledged as innocent victims of wrongful conviction. This is a small number in the grand scheme of American criminal justice, but it doesn't count the many other wrongfully convicted individuals who are unable to meet the high bar for overturning a conviction. It also fails to account for the exponentially increasing exposure of wrongful convictions through the use of relatively new science, such as DNA analysis. Regardless of the number, however, wrongful convictions are unacceptable. They literally cost victims their lives. And yet Innocence Projects and Conviction Integrity Units across the country continue to find innocent men and women who have served decades in prison. Why is this? 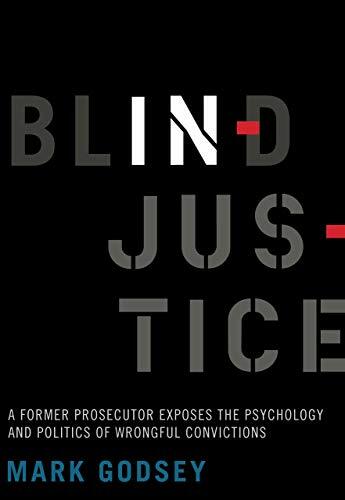 Answers can be found in Blind Injustice: A Former Prosecutor Exposes the Psychology and Politics of Wrongful Convictions, a psychology book written by law professor Mark Godsey, a federal prosecutor turned activist for the wrongfully convicted. The arguments put forth by Godsey are as convincing as they are eye-opening. Godsey starts his analysis with the premise that "most of the injustice in the criminal justice system results from the actions of good people, not the really bad apples." Common sense dictates that the actions of good people should not lead to injustice. But it turns out that all people are subject to certain distinct psychological weaknesses, and those weaknesses can and do sometimes lead to injustice. One such weakness is cognitive dissonance, "a psychological phenomenon that can cause us to push aside or deny information that conflicts with our most deeply held beliefs." In the criminal justice context, cognitive dissonance can lead police and prosecutors, who believe strongly in the righteousness of the system, to act irrationally, defensively and unjustly. Prosecutors, for instance, routinely object to post-conviction requests for DNA analysis. Given the power of DNA to solve crimes, one may wonder why a prosecutor charged with enforcing the law would not jump at the chance to ensure that they have convicted the right person. Godsey suggests that this is because prosecutors already "know" that they got the right person. Evidence to the contrary is resisted by the psyche. In addition, the criminal justice system tends to dehumanize defendants, making them "less than human and thus not deserving of moral consideration." Police officers and prosecutors deal with thousands of cases in which they must punish, and doing so is much easier on the mind when the punishee is not human—perhaps an enemy, or even an evil thing. Prosecutors and police are also subject to confirmation bias. Humans naturally seek evidence to support existing beliefs. Even in the face of clear evidence contrary to a belief, studies show that people tend to stick to their beliefs. This includes those with authority in the criminal justice system. In the criminal justice context, confirmation bias manifests in several ways. Prosecutors and police form a theory and then ignore contrary evidence. Investigators twist evidence to support a theory. And forensic analysis often starts with a theory that it intends to confirm. Experts, Godsey points out, are often told who did it, and then asked for confirmation. In short, confirmation bias leads to . . . confirmation. As such, scientific accuracy falls to the wayside. Godsey also examines how human memory works. Prosecutors and police often rely on eyewitnesses to prove a crime. But it turns out that our memory is notoriously fallible. Memories are constantly edited, and are subject to encoding errors. They are also subject to cognitive dissonance—meaning that false memories are sometimes created in order to ensure psychic consistency. And memories can be easily contaminated by extraneous information, personal bias, and even confirmatory feedback from police. Our new understanding of how memory works helps us to explain why faulty eyewitness identification is by far the greatest cause of wrongful convictions. False confessions can also be better understood by examining how memory works. Godsey points to one study where professors were able to get 70 percent of a group to create false memories of a fictitious crime using typical interrogation methods. Indeed, Godsey argues that the police interview atmosphere is highly conducive to false memory construction. Blind Injustice provides great insight into how wrongful convictions happen in a system designed to avoid them. The insight is deceptively simple, but compelling: human beings are possessed of psychic weaknesses that all but guarantee the imprisonment of innocent men and women. With this knowledge in hand, what will we do to address the problem?